Plot/Storyline: The characters ‘Anger’,’Fear’, and ‘Disgust’, complain they’ve never had the opportunity to discover any of the islands. Joy decides to take them there to get them there (via the Train of Thought) to stop the complaining. (So far, these aspects have been introduced as a pre-show). Guest is offered the chance to come along. The train is pulling out, and you don’t want to miss it! 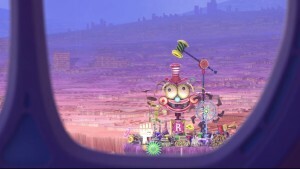 Along the peaceful ride, Joy starts to remember her time with Bing Bong, but the train comes to a sudden stop. It appears a Creative Block has landed on the tracks. The weight of the block bends the track straight down to the pit of forgotten memories. Looks like this train isn’t going to make it to it’s destination! But maybe…just maybe…a little ‘song power’ might get them back to Head Quarters safely! Elements used: Scenic Projection, Duel Projection (3D), Track Reversal, Forced Perspective (3D). Unique Feature: Projection originates from the top of the passenger trains, giving the illusion of faster travel and/or misleading direction. Closest technologies currently used on Everest, Dinosaurs, Tower of Terror and Space Mountain. ~ by admin on June 24, 2015.